When creating the “Internet Marketing Attorney” moniker in 1997, I would scour the web for the most innovative law firm websites, eventually rating and ranking them in five categories–design, content, usability, interactivity and intangibles. If you were listed among the 250 largest U.S. law firms, you were then ranked accordingly. Many small and midsize firms from around the world submitted themselves for consideration as well, and while I did not review all of them, I also had the annual Nifty Fifty list of innovative legal website components. But times changed and just like technology, I had to adapt. There were three key factors that led me to stop presenting the IMAs–as they are known throughout the legal industry. 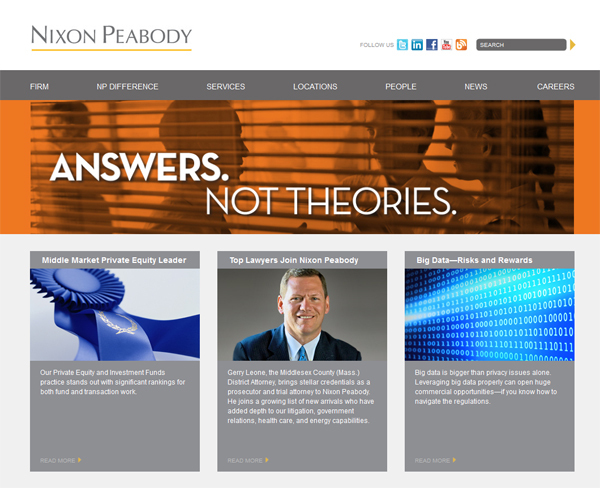 First, the large law firm sites become homogenized. There were so few substantive differences to the sites that it made finding those differentiators quite difficult. I would write the same notes and comments over and over again. Second, my “for-profit” business (HTMLawyers, my law marketing consultancy) did not provide enough free time to properly conduct these evaluations. Because I never solicited those law firms I reviewed, it was a great branding tool but not necessarily a revenue generator. My time was always “sold out”, but it was tough to equate new business with the time needed for the IMAs. Finally, any free time or “down time” is now owned by my children–who do not find law firm websites all that fascinating. Luckily, my monthly contributions to Web Marketing Today allow me to continually monitor and teach best practices for law firm internet marketing. Which is a long-winded way of introducing this month’s WMT column, Law Firm Websites: A Developer’s Review, where in essence I turn the tables slightly by asking the web site developers to tell me what site they like best and why (obviously, their own handiwork). I invited some of the more prominent names in law firm website development to participate–just give me a site and what makes it special. The end result is a handy tutorial for any law firm looking to identify key components for their next website. The cited sites offer a nice mix of law firm geography and size. Included in this column are websites developed for McElroy, Deutsch, Mulvaney & Carpenter, Freeborn & Peters, Sideman & Bancroft, Nixon Peabody, and Jeffer Mangels. Thanks to Inherent, Saturno Design, Duo Consulting, Bothwell Marketing and Justia for taking part. Each provided me with a website, some background and key features. In my 17 years of working on law firm website projects, I’ve had the opportunity to work with hundreds of developers throughout the world. In many cases, I’ve reviewed their RFP responses to law firms in helping select the right provider. In others, dozens of law firm website developers keep me informed of their newer launches and products–helping me pass that information along to my IMA and WMT readership. This month’s column is a map of the newer online features that merit consideration in building or upgrading a law firm website.